The B-Link Secure Cellular Outdoor Camera is designed to give users complete control over your security, allowing you to monitor your footage even remotely. The rugged camera design is guaranteed to withstand weather and wild conditions, making it possible to position in wooded areas to watch wildlife, in parking lots, on unmanned construction sites overnight, etc. The camera is battery operated with 8 AA batteries, making it unnecessary for you to source electric power or a WiFi network wherever you wish to position your camera. The camera features a range of configurations for security flexibility, including adjustable PIR sensitivity, multi-shot, time lapse, timer, TV out, and stamps on each image and video including camera ID, time, location, etc. With a 100 degree wide viewing angle, a 110 degree PIR angle, and night vision up to 65 feet, you’ll be guaranteed to capture everything that goes on in front of your camera. Your B-Link Secure Cellular monthly subscription of $19.99 includes up to 1GB of data, which will enable you to view over 120 hours of streaming video per month. Data is only used when you're connected to your camera for remote view or download. If the camera is running and recording, but you're not viewing the video remotely, or the camera isn't uploading video, then no cellular data will be used. Data consumption will vary by camera type, video resolution settings, recording trigger settings and other factors. If you exceed 1GB in a particular month, you will be billed $24.99/GB data used. If you find you're consistently using more than 1GB of data per month and would like a larger data allotment, we're happy to upgrade your plan on request. Your service won't be throttled or suspended. 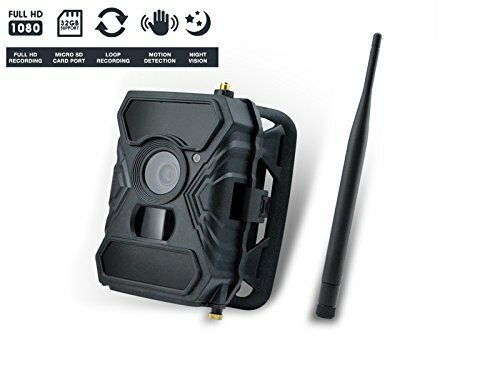 Rugged Outdoor Camera Comes Equipped With Built-In Cellular Service, Remote area without power or WiFi connection. Compact Design - ONLY 5.17 x 3.88 x 3.04 Inches, Rich features and functions designed to provide you with maximum control over your outdoor security. If you have any questions about this product by Brickhouse Security, contact us by completing and submitting the form below. If you are looking for a specif part number, please include it with your message.